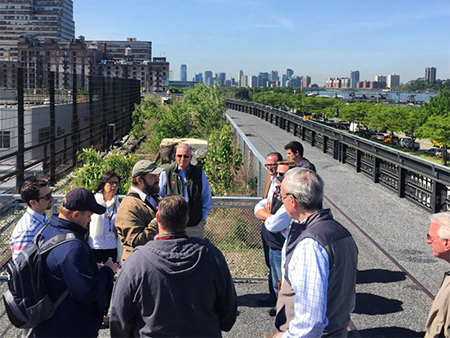 Architectural historian Matt Postal leads a walking tour of Manhattan's Hudson Yards area. Rain or shine. RSVP here for a $10 fee. Join us for a two-hour walking tour of Manhattan’s Hudson Yards area, New York City’s newest neighborhood, largest construction site, and controversial flashpoint. We will view and discuss this massive development of residential, corporate, retail, and arts properties, as well as the MTA’s 7 train extension, which has played a major role in the development. Visit and learn about projects by leading architectural firms Diller Scofidio and Renfo, Kohn Pedersen Fox, and Thomas Heatherwick, and join in discussion about how these new constructions are transforming the city’s west side in its largest development since Rockefeller Center’s construction in the 1930s. Matt Postal is an architectural historian based in Brooklyn. He teaches graduate classes on the history of New York City and its extraordinary 19th and 20th century architecture, researches and writes designation reports for the Landmarks Preservation Commission, and since 1990, leads popular and entertaining walking talks and tours throughout the five extraordinary boroughs of New York City.